When the High Dam was built at Aswan, a number of ancient temples were moved to the island near Aswan, now known as New Kalabsha. 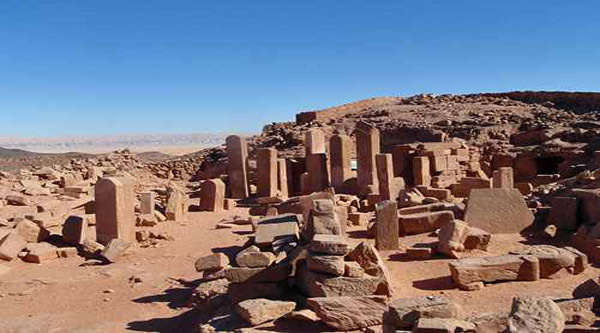 The most significant monument reconstructed here is the Kalabsha Temple, dedicated to the Nubian god Mandaulis. This measures 74 meters from the pylon to the rear wall and is 33 meters wide, making it the largest freestanding temple in Egyptian Nubia. Only three rooms on the interior are fully decorated, and the temple contains an inscription left by Silko,a Nubian ruler, reflecting the rise of Christianity in the 6th century AD. Also on the island are the Temples of Beit el-Wali and Gerf Hussein, both dating to the reign of Ramesses II; and the Roman Kiosk of Qertassi plus chapel of Dedwen. 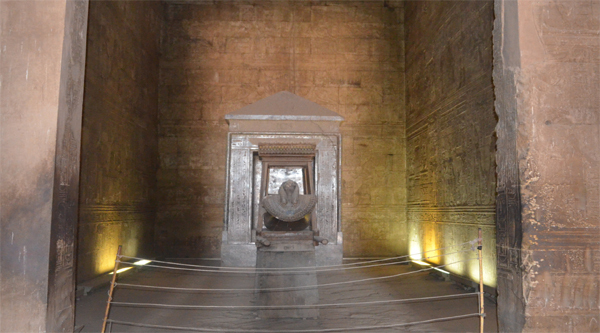 The original temple of Kalabsha was dismantled by a West German team into 13,000 blocks of sandstone and were re-erected at the present site between 1961 and 1963. The temple of Kalabsha stood 50 kilometers south at ancient Talmis, which is now submerged. The city of Talmis was situated on both sides of the Nile at a point where the river narrowed, giving the area its name Bab el-Kalabsha, the Gate of Kalabsha. The temple was built in the time of the Roman emperor Augustus, in the last century BC, presumably on the site of an earlier temple of the 18th Dynasty, as Amenophis II is depicted in the pillared hall, and a black granite statue of Tuthmosis III was observed near the river bank in the last century, although its whereabouts is now unknown. Certain additions to the temple were subsequently made by Emperor Gaius, known as Caligula in AD 37-41 and by Trajanus, known as Trajan AD 98-117. The carved relief decoration of the various parts of the temple was not completed, except in the innermost chambers, and in several place there are roughly carved graffiti of different figures, especially falcons. The impressive pylon is set slightly askew to the east-west axis of the temple and the causeway. It is well preserved except for the cornice, but is undecorated apart from the doorway and the winged sun-disk above it. On the right-hand side of the entrance passage the emperor Augustus is shown before Horus. Coptic graffiti and crosses can be seen by the doorway, indicating the temple?s later reuse as a Christian church. 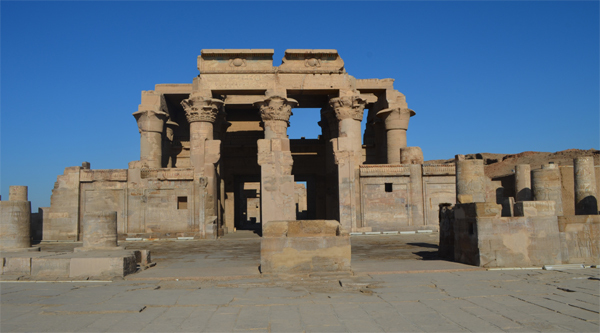 The temple follows the standard plan with a monumental pylon followed by an open court, hypostyle (pillared) hall, and vestibules preceding the sanctuary. The open court at Kalabsha had a colonnade with 14 columns on the north, east and south sides, but only the columns on the north and south sides still stand up to their original height and display the complex floral designs that are characteristic of temples of the Greco-Roman period. The designs of the capitals are arranged in pairs facing each across the court. The two at the far end and right represent palm branches with bunches of dates hanging underneath. There is no decoration on the walls of the open court. On the south side of the corridor is a circular Nilometer, now well above the water level, with a staircase going down beside it. Nilometers were used by the Ancient Egyptians to measure the gradual rise of the annual Nile flood in the summertime, first of all so that word could be sent northward regarding the possible limit of the flood, which would indicate the amount of work needed making channels and dikes to control the extra water. Secondly, tax assessors were able to make a preliminary estimate of the revenue to be gained from the harvest the following spring, based on the eventual predicted height of the inundation. Behind the temple to the southwest is a chapel consisting of a small rock-cut chamber enclosed by a forecourt of granite pillar with screen-walls. Only the door-way of the chamber is decorated and has reliefs of an unnamed pharaoh offering to the Nubian god Dedwen. As this chapel was originally inside the mud-brick enclosure wall of the temple precincts, it may have served as a birth-house. To the northeast of the temple pylon is a small, unfinished chapel of the Ptolemaic Period from the reign of Ptolemy IX, which therefore predates the larger temple. 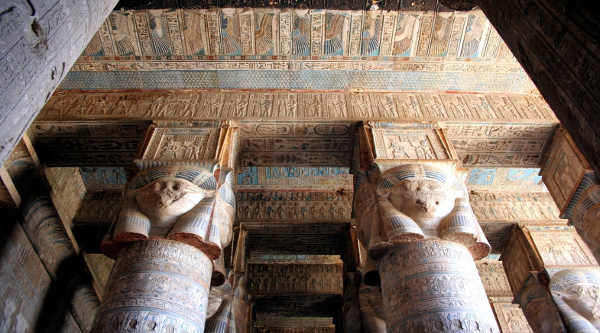 The exterior of the chapel is undecorated, but reliefs inside show the king offering to the Triad of Elephantine, Khum, Satis and Anukis, as well as to Mandulis, Wadjet, Osiris, Isis and Horus. On the north side of the temple is a granite stela of Psammetichus II of the 26th Dynasty, recording his successful Nubian campaign in 593 BC. On the south side are several prehistoric petroglyphs dating from 5000 to 3000 BC, which were also brought from further south and show various animals, such as elephants and gazelle. Very remote temple usually visited on Nile cruises but we were lucky enough to visit it when staying in Aswan. Not an easy task to get a boat to the temple but it worth it! You are alone on the beautiful island enjoying its ancient monuments, temples and especially the Kiostk of Qertassi, so so cute.